Plough Gallery. Photograph by Glenn Josey . Tifton is three hours due south of Atlanta. It is a rural, agricultural community with a high number of academics, who work in regional colleges, research facilities, and the sciences. For more than twenty years, Tifton hosted the Love Affair, an arts festival that brought arts and music to the area. Due to economic change and lack of support, it folded. Nevertheless, I chose to root and grow a new cultural destination in Tifton, seeded by my belief in the power of education, community, and craftsmanship. Earlier in my life, I’d wanted to start something from nothing, and that idea found a home base here. My nature as a sort of contrary human and my self-acknowledged lack of common sense at times has led me to think that moving here was what I was “supposed to do,” meaning to take all my bread crumbs of prior connections and experiences and start laying them down in rural Georgia. From all this, came the opening of Plough Gallery. 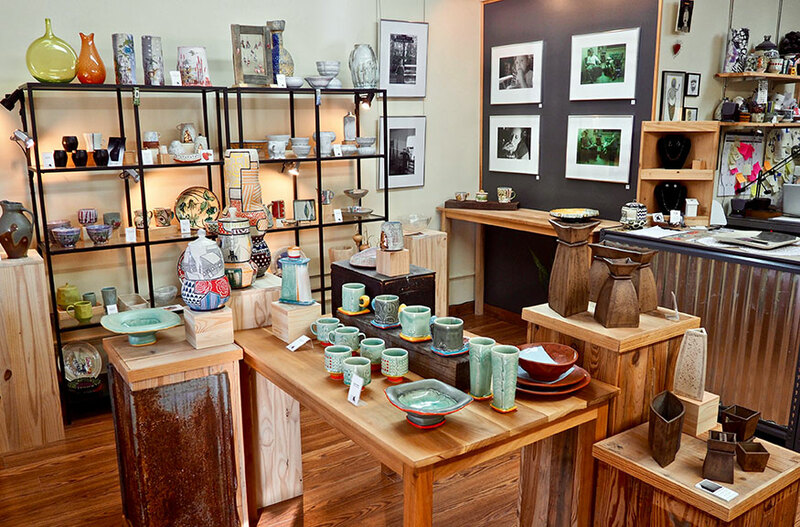 Plough is a small studio and gallery space that my partner, Glenn, and I started in 2014. The building is three blocks from our home, on a side street without much walking traffic, or much traffic at all for that matter, but perfect for two guys starting something from scratch. We set up a few sawhorses and planks and got to work. That first year when the holidays came, we invited our community into the gallery through social media, word of mouth, and a simple sign outside. We were open for business. People have asked me, “Why Tifton?” so often it has almost become a joke. Both locals and people farther away asked this question when I merely mentioned the idea of moving to this place, opening a gallery, and expecting to succeed. You should understand that I never expect to succeed at anything. That pure expectation of failure is at times my strength and my curse. One of the struggles of starting something from nothing is that it lacks a definition for understanding the means by which success is achieved. Our definition of success with the gallery has come down to being able to say yes to two simple questions. One, are we showcasing the work of artists with respect and admiration for their hard work and dedication to their craft? Two, are we broadening our community’s understanding of the handmade? And I’m happy to say I think we can answer in the affirmative, or at least that we’re getting there. When we opened, we invited potter Lindsay Rogers to present her work to our community. We partnered with the Georgia Museum of Agriculture to host an event based on Lindsay’s MFA thesis work, which consisted of pots made for the bounty of her garden. Her thoughtful marriage of forms and concepts, based on her love of organic farming and nourishment of the soul, perfectly paired with our gallery’s mission. An event that was meant as a small gathering of the farmers market crew and a few local enthusiasts turned out to be a lovely evening of about sixty people listening to Lindsay talk about her work, her relationship to the earth, and her love of community. It was free to the public and gave our gallery and community a chance to understand our goals. The word plough often gets mispronounced, but the name is rooted in Glenn’s experience growing up on a farm here in rural Georgia. He has always been a man with his hands in the dirt, always connected to the way things from the earth bring so much to so many. We chose the name Plough because it represents my passion for clay and his passion for the harvest. The items we show are as connected to the earth as Lindsay’s vegetables. Our community’s understanding of that helps us connect directly with our neighbors in a way that art sometimes does not. Once they get it, they truly begin to open up and explore what we are offering. In April, 2015, we held our second event, Tea: The Ritual and Art, Celebrating Culture and Practice. Again, we worked with the Georgia Museum of Agriculture and its curator and the incredibly passionate art lover Polly Huff. The exchange of cultures through drinking tea is a theme of Japanese tea culture and continues to be the role tea plays in the South. We held a national call for artists to share tea bowls and teapots. The variety of work we received was truly eye-opening. Our little small-town gallery was exhibiting the work of artists from all over the country and from Canada and Trinidad. To share this breadth of work and cultivate our newly engaged community’s understanding of it has been the highlight of our venture. We held the opening on a warm Saturday afternoon. More than eighty people attended, then stuck around to join us at the Georgia Museum of Agriculture afterward for a traditional Japanese tea ceremony hosted by the Japan-America Society of Georgia. Hoping to have some of our gallery attendees at the ceremony, we were overwhelmed when more than two hundred people attended. It brought tears to our eyes. Once again, a free cultural event was offered to enrich our community, and the community responded. This is how it all starts. Wherever it is. It starts with people opening doors, with taking the chance to find a place and put an “open” sign in the window. That is the easy part. Managing the expectations of your community and knowing your purpose is what keeps you focused. There are days when it is difficult to be a maker and a gallery owner. Balancing being engrossed throwing my pots with keeping the door open to questions about (and sometimes a misguided understanding of) our purpose can be a challenge. But our job is to share. Our job is to make the place where we live more aware, more vibrant through art. There are not many other things besides art that I am suited for, so I’d better be good at it. 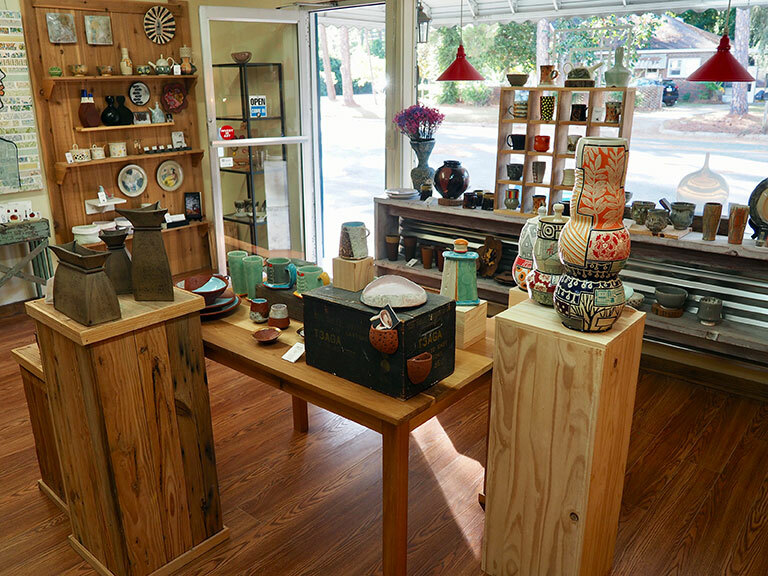 After the “Why Tifton?” question, the second-most-often thing we hear in our gallery is “I had no idea.” Many people in our community simply have not been exposed to the rich and vast world of craftsmanship that many of us in the ceramics world take for granted. We spend time telling our visitors all they can stand to hear, starting with the basics, such as who we are, where we come from, and how we make things, and then moving on to the why we do it. For us, all of this matters as we lay the groundwork for building a community of craft and art lovers. On the other hand, we have been very fortunate to find some in our community who get exactly what we are doing. From the beginning, they have supported us by coming to openings, bringing by friends and family from out of town, and simply sharing our social media posts. In the three years we have been open, we are as unceasingly surprised and delighted by and thankful for the returning faces as we are for the new and unfamiliar. Our goal, all in all, is to keep opening eyes to world craftspeople and the handmade. We know it is an endless path that we are mowing as we go, but we’ve learned from those that have done this before us not to stop because only a few people come. We pay our artists, we pay our rent, and we plan our next events. We are always searching for more space because sooner or later, we’ll have to expand. We have to make space for those who want to come in to see, and that’s a problem we are glad to have. We are so lucky—all of us, as artists—to turn someone on to something new every day. Within our ceramics community, we do not always get that same new, fresh feeling that we get to give to those that are not in the know. To bring something new to the public and have it bring them joy is why we teach, we curate, show, and so on. I mean, come on, what a job we have! Will we ever be rich because of this? I think we all know that answer. If we could retire on good art and laughter, smiles and joy, we would be endlessly floating in our pools. This is, in a way, our retirement; this is what we will do for as long as we can. Glenn and I have other jobs, as a full-time nurse and a university teacher, respectively, but every Friday we open the doors, and keep sharing what we love with all who are willing to look and listen. Mark Errol has been a lecturer at Valdosta State University since 2015. He currently lives in Tifton, Georgia, where he maintains a studio and is the co-owner of Plough Gallery with his partner Glenn Josey. Mark shows his work nationally and internationally. Contact him at marksmud@me.com, and check out his interview with Ben Carter, Tales of a Red Clay Rambler podcast #241.